Wondering about suits and how to fit them? You’ve come to the right place. First, what is a suit? A suit comprises a jacket and pants in the same fabric. Do not buy a jacket or pants separately and then go looking for a matching piece whose fabric is just “close enough”. A suit is bought as two (or three) pieces together, in exactly the same fabric, from the same bolt. That settled, how to decide between the myriad suits available? There are four basic areas in which to assess a suit – fabric, construction, fit, and styling. You should consider all these aspects of a suit before deciding on which to buy. The advice in this article will be geared towards someone buying a small number of suits that he hopes will serve him well in a variety of different settings. The suit should be made of 100% wool, no elastane, no polyester. Do not be tempted by cotton or linen or cashmere suits. They do have their place in a large wardrobe, but they are not for starter professional wardrobes. Since you’ll be starting off with suits that you’ll want to wear year-round, get a medium-weight wool (say, somewhere between 9 and 13 oz). Most suits on the market fall in this category so don’t get worried unless the suit seems particularly thin or heavy. The fabric should be worsted wool, meaning that it is smooth to the touch instead of feeling wooly and hairy like a sweater. An exception to this is woolen flannel, which is acceptable as an alternative to worsted in all but the most formal of office settings. The difficulty is that woolen fabric is quite warm, so if you live somewhere with hot weather, is a less attractive option. But if after 3 medium-weight worsted suits you purchased a woolen as your 4th and a lighter weight suit (with some mohair in it, for instance – mohair makes a suit wear cooler) as a 5th, you’d be better prepared for particularly extreme days and have somewhat more variability in your wardrobe. Avoid fabrics that are above “Super 120s” as they will wear out too quickly. To learn more about different fabrics check out the cloth thread. As discussed previously, the fabric should be a solid color, at least for your first three suits. Again, you want to be ready for all suit-wearing situations. It helps if each suit goes with as many different shirts and ties as possible. Patterned suits go with fewer shirts and ties than solid suits. And there are virtually no situations in modern life where the more casual patterned suit is appropriate, but a solid suit is not. A solid worsted flannel is a very versatile choice, at least in cooler climates. The fabric you see on the outside of a suit jacket is far from the only cloth that is used in its construction. Inside the chest and the lapels are pieces of cloth that give the jacket its structure. What these pieces are and how they are attached to the rest of the jacket is the main differentiator of construction quality between suit jackets. The lowest quality jackets are made with a piece of “fusible” interlining that is glued to the front of the jacket. This results in a stiff chest and roll of the lapel. Fused jackets also may have reduced longevity, although there has been significant improvement in fusing technology in recent decades, such that this may no longer be true. Older fused jackets were infamous for having the interfacing separate from the body fabric after many dry cleanings, with awful and obvious ‘bubbling’ ruining the jacket. Higher quality jackets are made “half-canvassed”, meaning that the chest piece and lapels are constructed with a canvas interior, which is then sewn to the rest of the jacket. Below the chest, fusible is used, but this is less problematic in the “skirt” (lower part of the jacket) than upper areas. Finally, jackets of the highest quality are fully canvassed, but most of these will be extremely expensive. Of course there are many other ways in which one jacket can be better made than another, but the divide between fused and half-canvassed is by far the most important one, and is also highly correlated with the others. If your jacket is half-canvassed, you can be sure you’re buying at least a decent quality garment. If your jacket is fused, you can be equally sure it is of shoddy construction. Construction quality has a loose correlation to price. Many highly priced brands (e.g. all but the highest quality Armani, Hugo Boss) sell fused jackets. Spending even $2,000 is no guarantee of avoiding a fused jacket. So you have to do your own investigation. 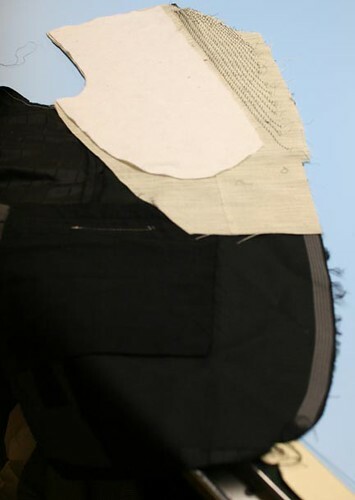 You can employ the “pinch test” around one of the higher buttonholes to see if you can feel a third piece of fabric floating in between the two sides. Alternatively, you can ask the salesperson. It’s possible they won’t know or won’t even know what you’re asking, in which case you should not listen to anything else they tell you. But the minimally informed salesperson will be able to give you this information. Commonly recommended brands that offer half-canvas suits at a reasonable price include Suit Supply (~$500), Brooks Brothers 1818 (~$1k retail, but frequent sales). eHaberdasher’s Benjamin line (~$500) offers fully canvassed suits which are very reasonably priced. Now we get to the hard part. Everyone’s body is different. Even at a retailer with a wide range of different fit types like Brooks Brothers, there may not be a jacket that fits you particularly well, no matter which size you choose. You may have to try a couple of makers before you find the one that suits you best. Some of this misfittery can be remedied by any tailor. Almost every suit you buy will need to have the length of the sleeves and the pants changed. These are simple operations. Everyone has their own method for determining the correct sleeve length. The estimable Guido Wongolini suggest that you begin by standing straight with arms at your sides, then lift your hands so that your palms are facing towards the floor, perpendicular to your body. The jacket’s sleeves should then just rest on the back of your hand. This should result in ¼” to ½” of your dress shirt’s sleeve showing. Pants should be hemmed so that they have little or no break, if they have an appropriately tapered leg (a leg opening of no more than say 18” in circumference). The waist of the trouser can usually be taken in or let out by about 2”. Adjusting the collar is a more complicated procedure. Your suit jacket’s collar should remain affixed to your shirt’s collar behind your neck at all times. Separation between the two is referred to as “gapping”. In a bespoke Savile Row suit, you might be able to play a round of golf without experiencing any gapping. This is harder to achieve with a ready-to-wear garment, but at least see if you can get the jacket not to gap, then walk around the room, sit down, stand up, and see if you’ve got any gapping. If gapping is a problem, a tailor may be able to fix it, but you might be going down a road with no end. Your life will be easier if you buy jackets that have no gapping problems off the rack. To examine the next part of collar fit, you’ll need a mirror or a friend for this one. Look to see if there are horizontal lines on your back, underneath the collar. If so, you’ll need the collar lowered. This is a reasonably simple, low-risk procedure. This could be accomplished by most tailors, but probably not your typical dry cleaner’s/alterations shop. It should cost around $40-50. The next three points of fit are crucial. If one of them is off, step away from the jacket. No tailor can help you. They are the waist, the shoulders, and the length. Styling refers to the decorative elements of the jacket that are unrelated to fit. Number of buttons, pockets, breasts, that sort of thing. If you’re starting out buying suits, you’ll want to buy a classically styled suit. Pants can be single-pleated, double-pleated, or flat front, cuffed or uncuffed. Once you get more experience you can decide whether and in what way to deviate from what is below. The suits that will never elicit any raised eyebrows are two or three-button single-breasted jackets, with two flap pockets, notch lapels, and dual back vents. Generally on SF two button or three-roll-two (meaning the top button is never meant to be buttoned) are preferred, but a “hard three” (roll to the top button, with the top button intended to be used) is perfectly acceptable, especially if you are tall. Lapels are of moderate width, reaching approximately half-way to your shoulders. Relatively innocent deviations include the absence of vents, ticket pockets, welted pockets. If you like them, go for it on one or two of your suits. Double-breasted suits and peak lapels on single-breasted suits are dandifications. Hold off on them until you know what you’re doing. A single vent, though acceptable, is an inelegant deviation, as it creates an awkward splitting of the rear of the jacket when you put your hands in your pocket. This article is an edited version of an article originally published on Styleforum.net in 2011.